B-1B bombers belonging to the U.S. Air Force’s 7th Bomb Wing at Dyess Air Force Base in Texas are bombing Islamic State militants in Iraq and Syria. But don’t take our word for it. Amateur photographers in Fallujah in western Iraq have published a photo montage depicting one of the huge, swing-wing bombers flying over the city. An unspecified number of B-1s are currently operating from Al Udeid airbase in Qatar. 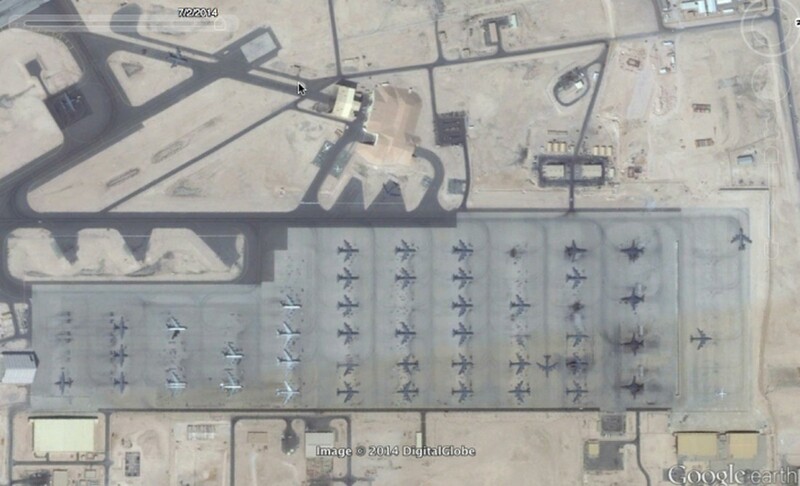 If you type the base’s name in Google Earth, you’ll see at least five of the bombers parked on the main apron, along with KC-135 tankers. The “Bones”—as their pilots calls them—originally deployed to Qatar along with 300 airmen to support Operation Enduring Freedom in Afghanistan. For years, B-1s have rotated through Al Udeid on six-month tours. Central Command diverted the bombers from Afghanistan ops and assigned them to the expanding U.S.-led air campaign targeting Islamic State militants in Iraq and Syria. Pentagon officials confirmed that B-1s took part in the first day of attacks on militants in Syria on Sept. 23. More or less at the same time, someone on an Arab Internet forum posted a composite image showing a B-1B circling over Fallujah, 50 miles west of Baghdad. Fallujah is an Islamic State stronghold. Previously, photographers had spotted a Predator drone over the Islamic State “capital” of Ar Raqqa, Syria—and an F-15E fighter over Fallujah. Strategic bombers like the B-1 can perform complex combined operations with other planes, fire stealthy cruise missiles and perform maritime attacks and even old-fashioned carpet bombings.